Left to right: Susan Santana, AT&T; Barbara Feinstein, USAID; Ambassador Capricia Marshall, Atlantic Council. Photo credit: Stephen Bobb. 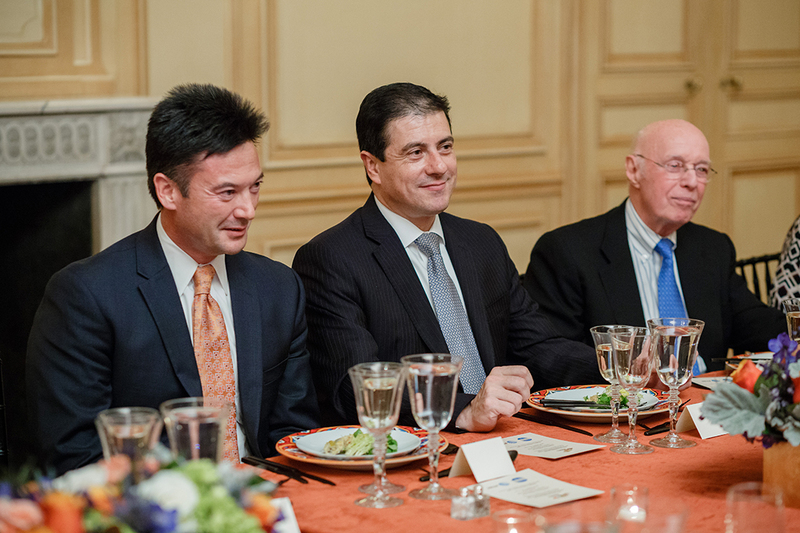 On November 28, 2017, Meridian partnered with AT&T to co-host a private salon-style dinner for His Excellency Gerónimo Gutiérrez, Ambassador of Mexico to the United States. The event was held as part of Meridian’s Global Dialogue Series, which are off-the-record facilitated conversations on issues of global importance. 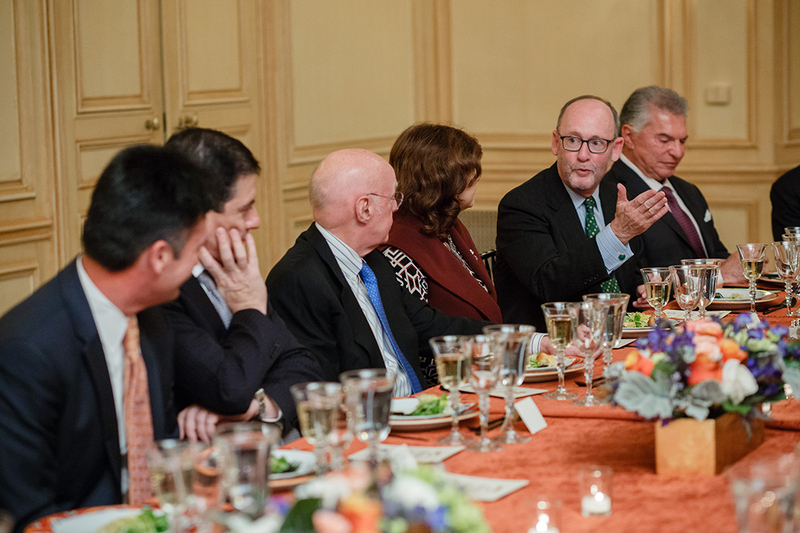 Amid ongoing and contentious NAFTA renegotiations, Meridian gathered a group of public and private sector leaders and decision-makers for a discussion on the magnitude of the U.S.-Mexico relationship and the various avenues to strengthen bilateral cooperation. 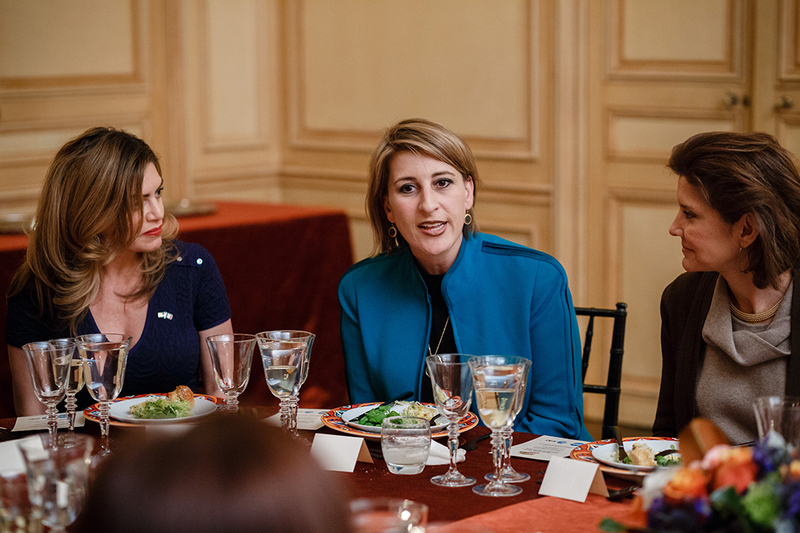 The evening provided Ambassador Gutiérrez with an opportunity to elaborate on important political, economic and social elements of U.S.-Mexico relations before several Members of Congress and Administration officials who offered their own candid feedback and perspectives. In addition to Ambassador Gutiérrez and Lori Lee, CEO, AT&T International/Global Marketing Officer, AT&T Inc., the dinner was attended by John Andersen, Deputy Assistant Secretary for the Western Hemisphere, U.S. Department of Commerce; Al Cardenas, Senior Partner, Squire Patton Boggs; Gabriela Domenzain, Latino Policy Institute Director, Roger Williams University; Barbara Feinstein, Acting Senior Deputy Assistant Administrator for Latin America and the Caribbean, USAID; Congressman Ruben Gallego (D-AZ); Ambassador David Gross, Chair, International Telecommunications Practice, Wiley Rein LLC; Secretary Carlos Gutierrez, Chair, Albright Stonebridge Group/Chairman, Meridian International Center; Ambassador Stuart Holliday, President and CEO, Meridian International Center; Congressman Will Hurd (R-TX); Ambassador Jim Jones, Chairman, Monarch Global Strategies LLC; Kelly King, CEO, AT&T Mexico; Eric Loeb, Senior Vice President and International External & Regulatory Affairs Team, AT&T Inc.; Dr. Mark Hugo Lopez, Director of Hispanic Research, Pew Research Center; Ana Navarro, Political Commentator, CNN and ABC News; The Honorable Paco Palmieri, Acting Assistant Secretary, Bureau of Western Hemisphere Affairs, U.S. Department of State; Dr. Mara Tekach, Deputy Assistant Secretary for Public Diplomacy, Bureau of Western Hemisphere Affairs, U.S. Department of State; and, Congresswoman Norma Torres (D-CA) among others. 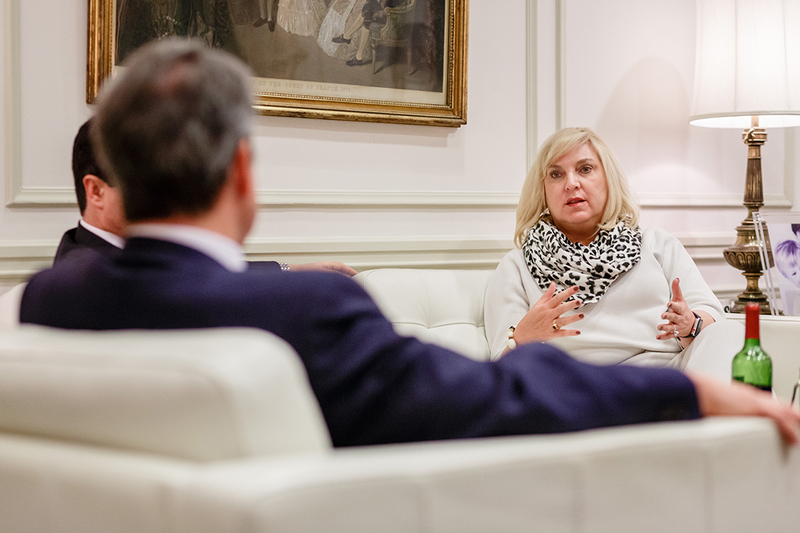 AT&T International CEO Lori Lee shares her vision. Photo credit: Stephen Bobb. Left to right: Kelly King, AT&T Mexico; Mexican Ambassador Gerónimo Gutiérrez; Ambassador Jim Jones, Monarch Global Strategies LLC. Photo credit: Stephen Bobb. 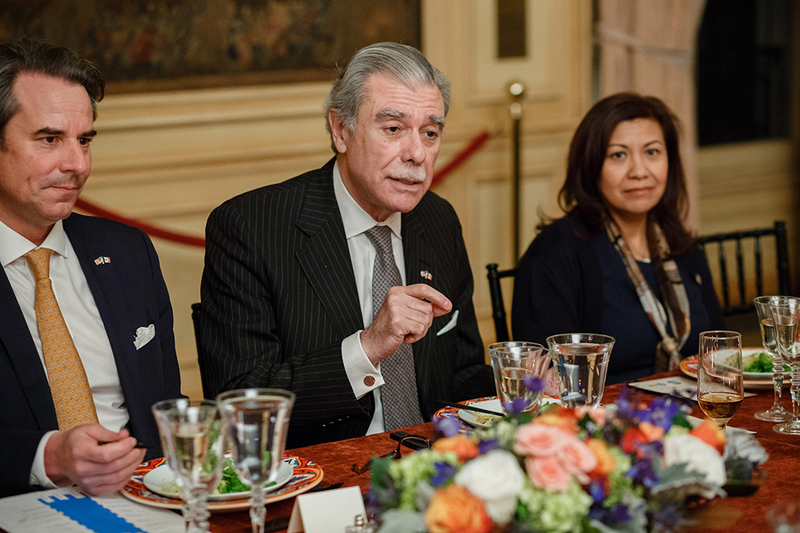 Ambassador Gerónimo Gutiérrez shares his perspective with Al Cardenas from Squire Patton Boggs and Ana Navarro of CNN. Photo credit: Stephen Bobb. 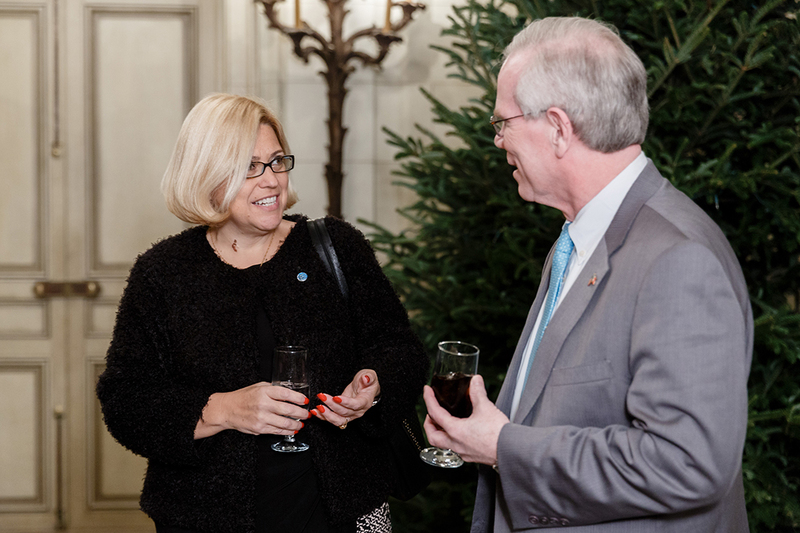 Celeste Carrasco of AT&T engages with Deputy Assistant Secretary John Andersen of the U.S. Department of Commerce during a pre-dinner reception. Photo credit: Stephen Bobb. 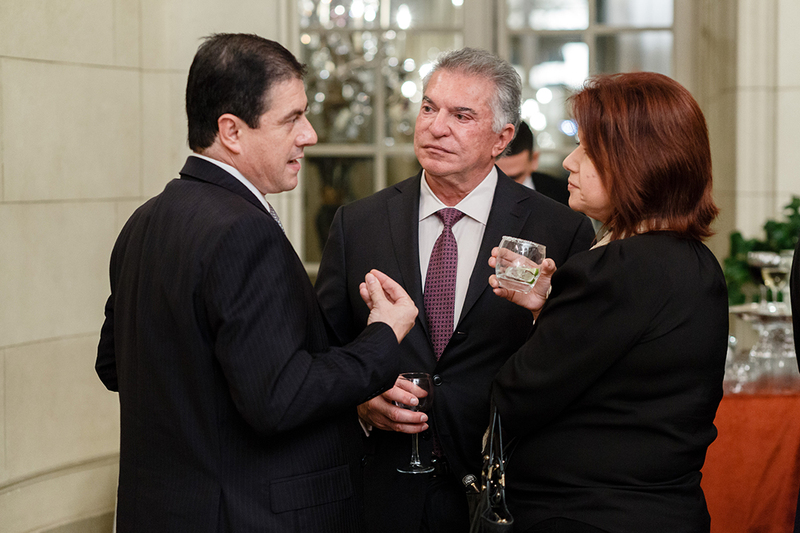 Left to right: Ambassador Stuart Holliday, Meridian International Center, Secretary Carlos Gutierrez, Albright Stonebridge Group and Meridian International Center; Congresswoman Norma Torres (D-CA). Photo credit: Stephen Bobb. 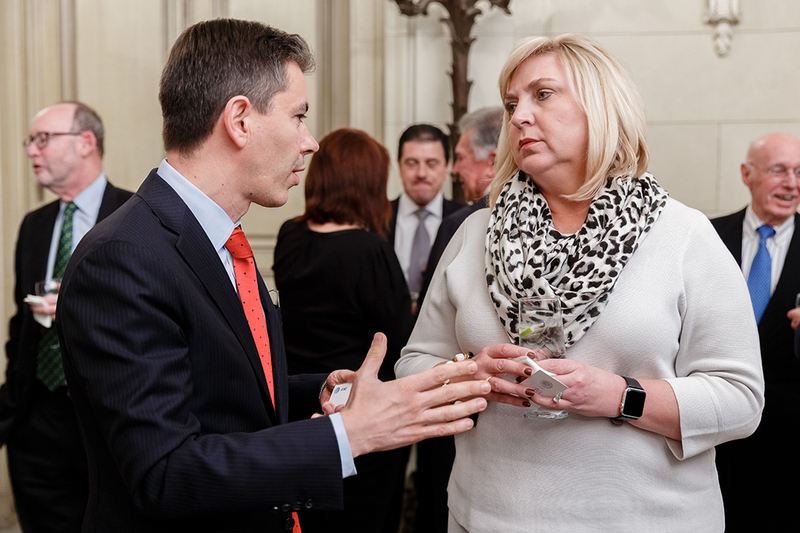 Sergio Garcia from the Embassy of Mexico converses with Lori Lee of AT&T International. Photo credit: Stephen Bobb. Congressman Will Hurd (R-TX) Photo credit: Stephen Bobb. 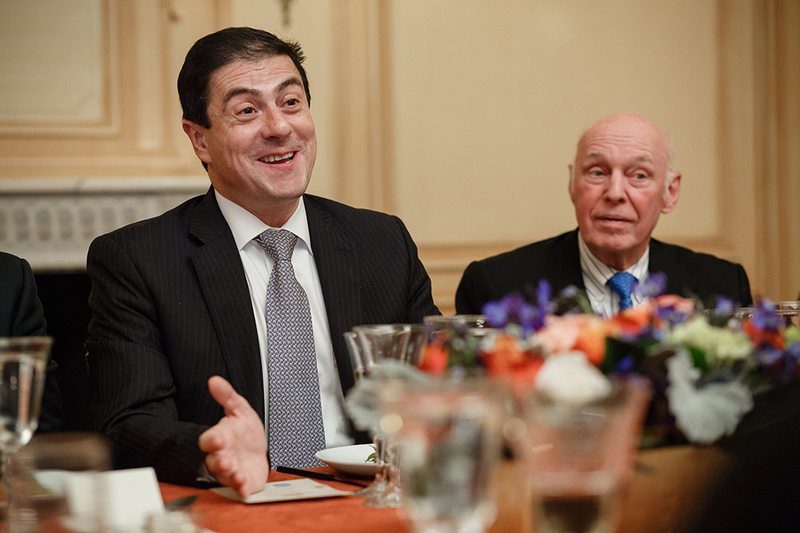 An animated Ambassador Gutiérrez engages in conversation as 1993-1997 U.S. Ambassador to Mexico Jim Jones looks on. Photo credit: Stephen Bobb. 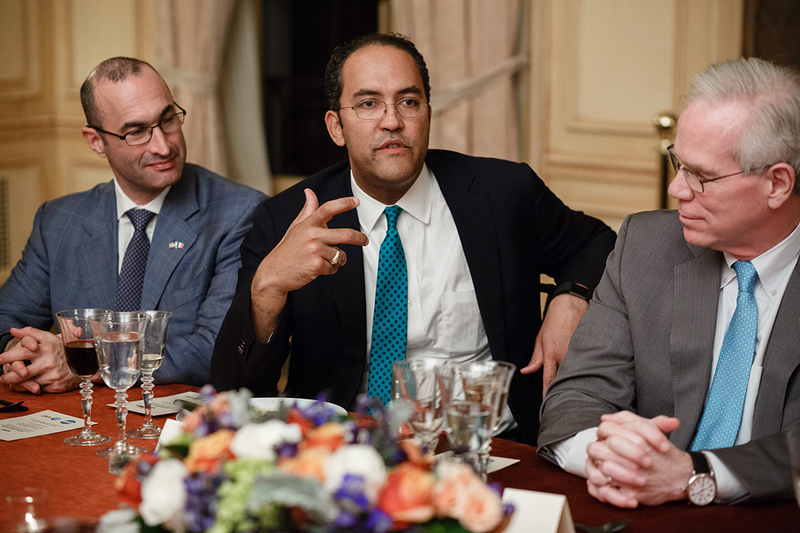 Ambassador David Gross of Wiley Rein LLC raises a point during the Meridian Global Dialogue Dinner. Photo credit: Stephen Bobb. 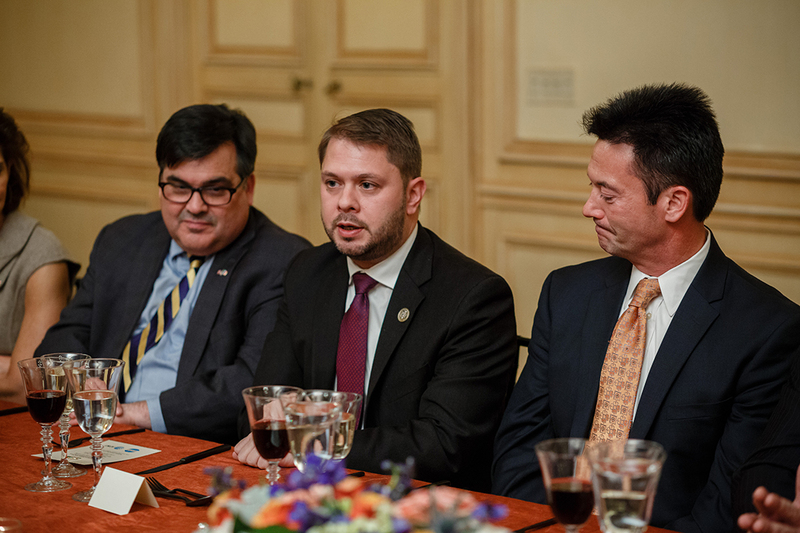 Left to right: The Honorable Paco Palmieri, U.S. Department of State; Congressman Ruben Gallego (D-AZ); Kelly King, AT&T. Photo credit: Stephen Bobb. 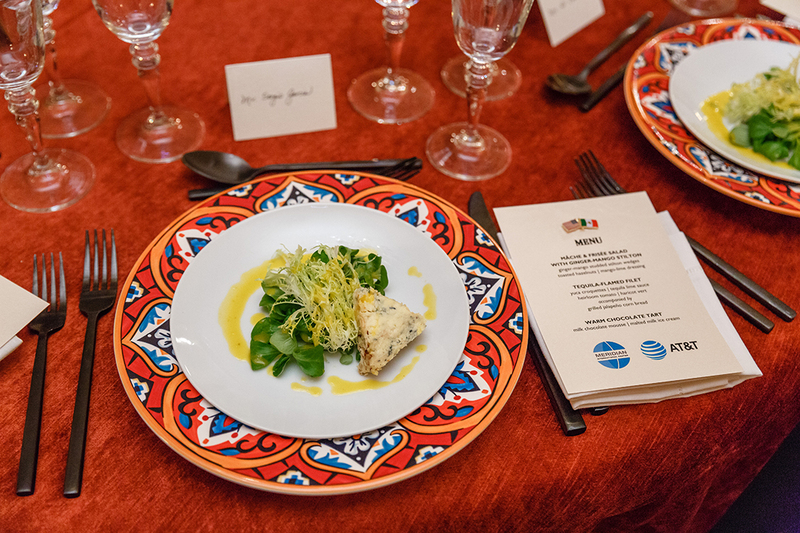 Meridian’s Global Dialogue Dinner series is held in the regal Meridian House. Photo credit: Stephen Bobb. 1. 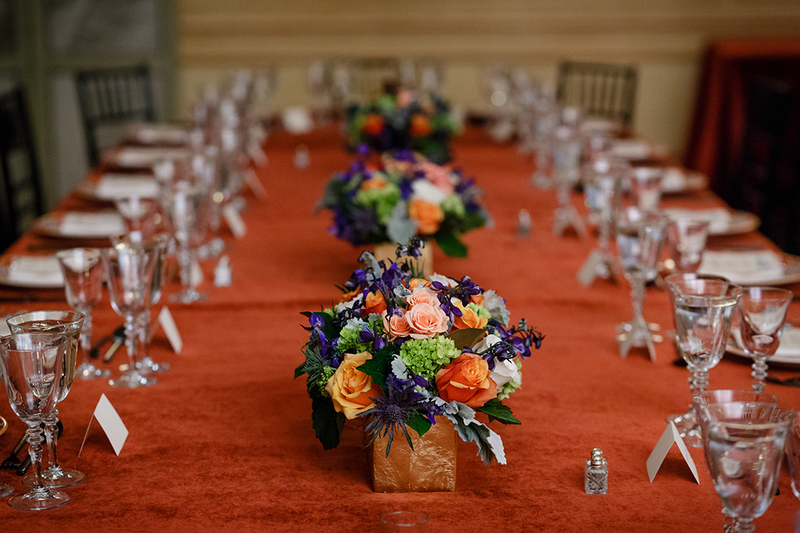 Meridian’s Global Dialogue Dinner series is held in the regal Meridian House. Photo credit: Stephen Bobb.